The founders of Freddies of Pinewood are Phil and Jo Whyte. They are not only connected by marriage but also share a deep love for the music and fashion of the 40's and 50's. One day they decided to turn their passion into a profession. Today Freddies of Pinewood is well known far beyond the borders of England. 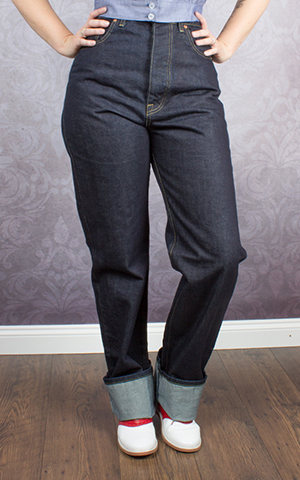 Especially pin-up girls and rockabilly fans all over the world love the authentic vintage jeans the label is offering. 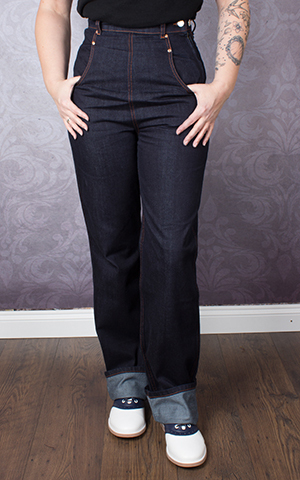 Freddies of Pinewood is the right adress for all ladies who like jeans from the swing and rock'n'roll era.Partly jeans by the label are perfectly reproduced original vintage denim. All of them are eyecatchers for your rockabilly and pin-up outfit. Robust, long lasting and good looking, they are the perfect choice for motorbike trips, party nights or just your usual daily routine. You will also find some pretty vintage style shirts by Freddies of Pinewood in our online shop to complete your outfit. Take a look.